On the beautifully manicured landscape along the waterfront of the Restigouche River in the town of Campbellton, New Brunswick visitors will find the information centre. When visiting the town of Campbellton, there is an Information Centre that will aid you in where to go and what to see while in New Brunswick. The Information Centre is located in the park like setting along the shores of the Restigouche River with a large welcome sign blowing in the breeze out front of the building. Visitor Information Centre along the waterfront of the Restigouche River in the town of Campbellton, Appalachian Range Route, Highway 11, Restigouche, New Brunswick, Canada. 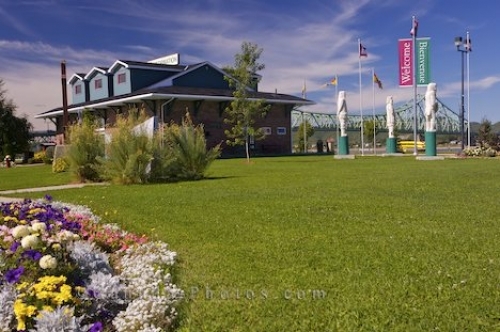 Picture of the information centre in the town of Campbellton, New Brunswick situated along the river waterfront.